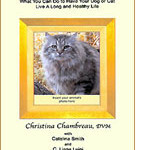 My dear friend and world-renowned veterinary homeopath, Dr. Christina Chambreau, has a very specific idea about how to achieve optimal health for your cat or dog. She believes (and I agree!) that keeping a journal is the key to early diagnosis of problems as well as the best way to monitor any treatments or response to changes such as an new diet, supplement, or remedy. There are many “early warning signs” of ill health, most of which we consider normal in our pets. However, what we’re really looking at is average, not normal. And unfortunately, average is a rather poor state of health for most of our companions. For example, we often consider bad breath, hairballs, waxy ears, lipomas, startling at loud noises, doggy odor, or red gums to be just part of being a dog or cat. But normal is a healthy coat, bright eyes, clean ears, and white teeth with uniformly pink gums. Journaling is a great way to track all these little signs–and watch them disappear–as you incorporate healthier practices such as better diet, appropriate supplements, more exercise, and holistic therapies. Dr. Chambreau has put together the Healthy Animal Journal, which gives you a fun and easy way to help your pet achieve excellent health. 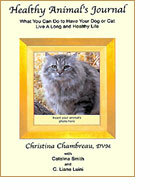 The first part of the book discusses what true health is for your cat or dog, and how to achieve it. You can insert your pet’s photo right on the cover. The second part includes downloadable, printable pages so you can track your pet’s health (as well as all the cute things she does, and the fun you have with her). You can just keep printing off new pages over time in order to stay current. This may be the best gift you could ever give to yourself and your pet; and I’ll be it’s something your animal-loving friends would love to have for their pets, too! Order your print copy of The Healthy Animal’s Journal through pay pal. Be sure to include your animal’s name (one per book) in the comment section so Dr. Chambreau can autograph it to this lucky companion animal. You can also purchase the print version with a check of The Healthy Animal’s Journal for your cherished dog or cat by emailing Dr. Chambreau at HealthyAnimals@aol.com. Retail Price – $17.95 per journal plus shipping and handling.